Post-Brexit, in the event of there being no trade treaty, UK exports to the EU-27 could expect to suffer tariff costs in the region of £5.2 billion, but the corresponding exports from the EU-27 to the UK would face costs in the region of £12.9 billion. These figures were advanced in previous Civitas research as a strong argument that it is in the best interests of the EU-27 to agree a trade treaty to permit tariff-free access to their markets to the UK. 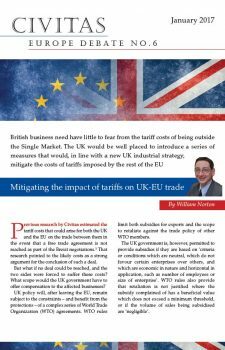 This paper considers the policy responses open to the UK in the event that a trade treaty is not reached, in terms of mitigating the cost of these tariffs for UK businesses. After Brexit, the UK will be bound by the rules of the World Trade Organization (WTO). It will be prevented from offering ‘prohibited subsidies’, linked directly to export performance, and will be at risk from retaliation by foreign governments if it offers ‘actionable subsidies’, those which cause injury to a foreign business by providing specific benefits for UK industries. Provided the UK establishes mitigation schemes which are non-specific, economy-wide measures, foreign governments will not be able to retaliate. Freed from the EU rules on state aid, the UK will be able to implement greater tax incentives for research and development expenditure for all businesses. This policy is justifiable in its own right. The cost would be in the region of £2.9 billion, of which £2.1 billion (73%) would go to industries suffering EU-27 tariffs. Freed from the EU rules on state aid, the UK will be able to operate a more extensive regional aid programme. Using simple rules acceptable to the WTO, areas covering 65% of the population could receive assistance worth £3.8 billion, of which £3.1 billion (82%) would go to exporting industries. At present EU rules limit the UK to assisting areas covering only 27% of the population. Freed from the EU rules on state aid, the UK can redesign its energy policy. Whatever it decides to do about emissions trading, and wider climate change policy, abolition of the damaging carbon price floor mechanism makes sense in its own right. It would release £1.2 billion in costs, including £392 million for domestic users of electricity. These measures would be supplemented by a Transitional Assistance Programme (TAP), a discretionary economy-wide scheme making payments to aid adjustment costs arising from Brexit, capped in practice at 1% of the value of a business’ exports. Set at that level, the scheme would not infringe WTO rules on actionable subsidies. The exports that would be affected by EU-27 tariffs are best considered in four main categories: (i) agricultural products, including food and beverages, which have their own WTO rules; (ii) ‘seriously-affected’ non-agricultural products, which face tariff costs in excess of 5% of the value of exports; (iii) ‘middle products’, where the tariff burden would be between 1%-5%; and (iv) ‘de minimis products’, where the tariff burden would be below 1% of the value of exports. Outside the EU, the UK would have to negotiate the assessment of its own ‘Total Aggregate Measure of Support (AMS) Commitment’, the WTO ceiling on permitted subsidies for agriculture. This threshold is likely to be the equivalent of €5 billion. Given WTO rules on the categorisation of agriculture support (the so-called Green Box, Amber Box and Blue Box), this will be more than sufficient to both implement a UK replacement for the EU Common Agriculture Policy and to mitigate the £1.7 billion tariff costs this sector would face. The ‘seriously-affected non-agricultural products’ (motor vehicles, most textiles, some chemicals, plastics, fishing, ceramics and aluminium) face total tariff costs of £2.3 billion. Because of the locations in which these businesses are based, and because of their R&D expenditure and electricity usage, it would be possible for the UK government to completely mitigate the impact of EU tariffs through R&D tax incentives, the abolition of the carbon floor price, the TAP and through regional aid. The ‘middle products’ and ‘de minimis products’ groups face EU tariff costs of £1.2 billion in aggregate. The same policies would not only mitigate the cost of tariffs, but would actually leave these industries with slight net gains. These mitigation measures are better considered not as a stop-gap response to an immediate problem, but as part of a co-ordinated long-term industrial strategy to improve British competitiveness for a global market. That is also the best means of matching up ‘winners’ and ‘losers’ from the tariffs and the mitigation measures. Such a strategy would have to be based on a horizontal, economy-wide approach. It would not represent a return to 1970s-style ‘picking winners’, if only because such an overt targeting of benefits would be heavily constrained by the WTO rules. Hitherto, discussion of the UK’s departure from the EU has focussed upon the risks of ‘Hard Brexit’ and the need to soften this by avoiding costs for business such as tariffs being levied upon exports to the EU-27. 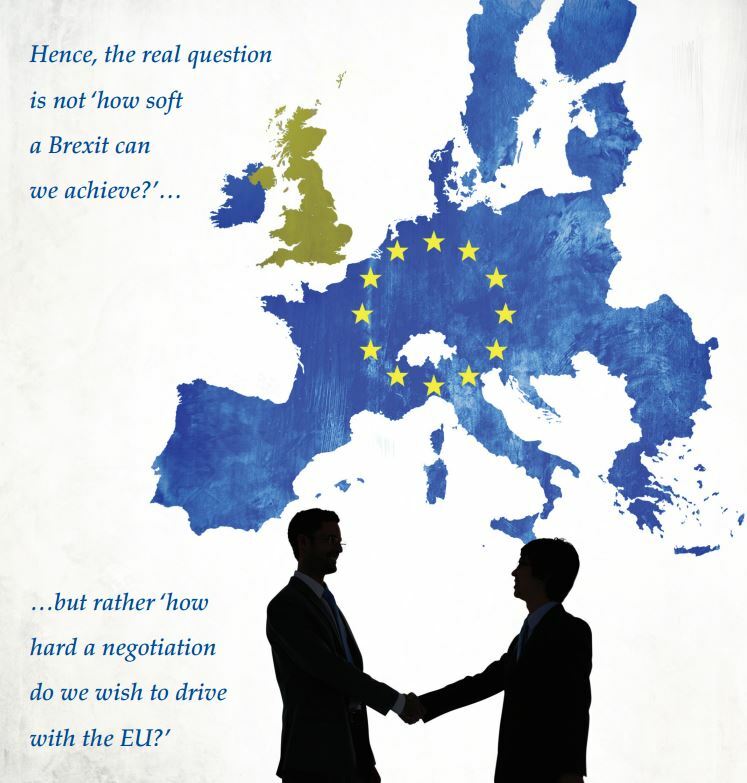 The real question is not ‘how soft a Brexit can we achieve?’ but rather ‘how hard a negotiation do we wish to drive with the EU?’ The balance of negotiating strengths is far more favourable to the UK. If the EU-27 decide to levy tariffs on British exports, Britain has little to fear. The UK should stop obsessing about the EU and worrying about how they will react. We should get on with the task of managing our own affairs in our own interests, and leave the EU to worry about their own problems. What does ‘Brexit’ mean? It means having nobody else to blame.